North Queensland prestige coach company, Calypso Coaches has turned to Higer to provide comfortable, luxurious but cost effective coaches to service Cairns, Townsville and Mackay. 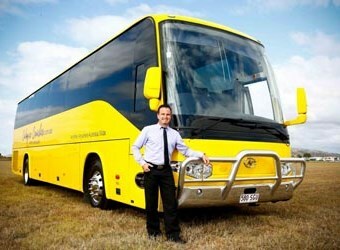 For the past 11 years, Calypso Coaches has provided luxury transfers, tours and school bus services and tailored transport solutions from its Cairns and Townsville depots and for the last four years has used Higer coaches, adding a 7.6m Munro, a 9.3m MidiBoss a 12.3 metre SchoolBossand two luxury 12.3m Roadboss VIP models. Calypso purchased its Higers through local North Queensland dealer, Macquarrie in Townsville. All of Calypso Coaches' Higers are equipped with leather seating to ensure its customers enjoy the five-star comfort the company is renown for. According to Ray Bosnich, managing director of Calypso Coaches, the addition of Higers to the fleet has been welcomed by both drivers and passengers. "We have had great feedback on the Higers because of the comfortable interior and ease of use," said Ray Bosnich. "We're impressed with the quality and finish of the Higers which was an important factor for us and apart from the luxury seats, everything we wanted came as standard. "The school bus we bought in 2010 has been hassle free, the quality is excellent and any minor problems we've had have been rectified quickly and in the most professional manner by Macquarrie." Another selling point for Calypso was Higer's competitive pricing across the range as well as quality componentry from Internationally recognised brands such as Cummins, Meritor and ThermoKing fitted as standard. "The pricing was a big factor in purchasing Higer as well as the commitment of its dealers," added Ray Bosnich. "Using reputable components in the suspension and drive train makes Higer an even more attractive package." Calypso Coaches is in the process of updating its fleet and Ray Bosnich is already looking to Higer with confidence. "I'd absolutely buy another Higer, and we are considering replacing the two older model Higers and Higer is top of our list," he said. Higer buses are manufactured in China utilising world's best technology and components, including Cummins engines, Allison and ZF transmissions, Meritor Axles and European designed chassis. All Higer models also receive an electrophoretic coating to enhance the corrosion resistance following a $30 million upgrade to the factory and the addition of an electrophoresis plant. The company's product line up starts at six metre buses and ranges up to full 18 metre vehicles catering to a variety of applications and specific requirements from high-end tourist coaches to high capacity city commuter route buses.